/EIN News/ -- MENIFEE, Calif., Feb. 01, 2019 (GLOBE NEWSWIRE) -- The master-planned community of Audie Murphy Ranch is located in Menifee, one of the most thriving young cities in the area. Recently recognized as one of Southern California’s Top 10 cities for growth, the town has become a major destination for families looking for convenience, opportunity and a dynamic way of life. Set in the heart of Southwest Riverside County, Menifee offers numerous shopping and dining hotspots, including the bustling Menifee Countryside Marketplace; great outdoor recreation at Diamond Valley Lake, the Menifee Lakes Golf Course and more; plus annual festivals and events that further its welcoming atmosphere. Parents covet the area’s quality schools, which include the new Taawila Elementary School onsite at Audie Murphy Ranch, while commuters appreciate the proximity to both the I-215 and 15 freeways, easing the drive to Riverside, Orange County, San Bernardino and San Diego. To make Menifee living even more appealing, homebuyers are turning to Audie Murphy Ranch as a home base, where they can choose from seven gorgeous single-family neighborhoods and enjoy exclusive resort-style amenities, sprawling sports parks, scenic trails and community events that open the door to fun and friendship. For residents of Audie Murphy Ranch, activity filled days will begin and end in their very own community. 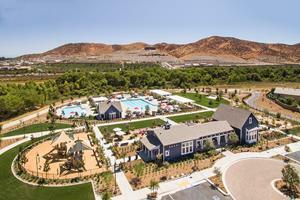 The highly-anticipated Ranch House has opened, providing residents of these Menifee homes a resort-inspired place to connect and kick back. The Ranch House features a beautiful recreation building, two swimming pools, a grassy amphitheater, game area and more! To learn more about owning a home at Audie Murphy Ranch, the #1 selling master-planned community in Menifee, visit model homes at individual neighborhoods or go to www.AudieMurphyRanch.com now for immediate details. Seven neighborhoods are currently selling at Audie Murphy Ranch, all built by the nation’s finest homebuilders. Kingston by Meritage Homes features one- and two-story energy-efficient homes. Interiors span from approximately 1,990 to 2,912 square feet with three to six bedrooms, up to three and one-half baths, comfortable Great Rooms, stylish kitchens with islands; flex rooms; covered patios; and two- to three-car garages. Prices start from the low $400,000s. Savannah by Brookfield Residential offers beautiful one- and two-story home designs spanning from approximately 2,718 to 3,492 square feet. Spacious living areas have three to six bedrooms, two to four baths, expansive Great Rooms leading to covered outdoor rooms, gourmet kitchens, bonus rooms, optional offices, flex rooms per plan; and three-bay garages. Connected Home technology is included with every home, allowing residents to control front door locks, lights, thermostats and more from their smartphones or tablets. Prices start from the mid $400,000s. Tribute by D.R. Horton captivates with innovative one- and two-story detached homes that include one design featuring a unique multi-generational suite with separate entrance. Ranging from approximately 2,474 to 3,172 square feet, floorplans offer four to five bedrooms, three to four baths, large kitchens with islands, lofts or dens per plan, a downstairs master bedroom in select designs, and two- to three car garages. Prices from the low $400,000s. Final homes are now selling at Province by Brookfield Residential, a magnificent luxury collection in a dramatic gated setting. Bright, flowing interiors span from approximately 2,949 to 3,488 square feet with up to six bedrooms, two and one-half to four and one-half baths, oversized Great Rooms with soaring ceilings, gourmet kitchens, a media room in select plans, optional outdoor rooms, and two-car garages with super storage. Prices from the mid $400,000s. Dakota by Woodside Homes presents smartly planned detached designs ranging from approximately 2,164 to 2,849 square feet. Open living spaces are highlighted by up to five bedrooms, up to three and one-half baths, large Great Rooms, studies per plan, and up to three bay tandem garages. Customize homes with a fireplace, convenient kitchen island, game room, outdoor living area and other appealing options. Every home includes a solar package for energy-efficiency. Prices from the mid $400,000s. The Ridge by Richmond American Homes is a stunning home collection featuring four beautiful one- and two-story designs. Interiors span from approximately 2,480 to 3,500 square feet with three to six bedrooms, including a first-floor bedroom suite; up to four and one-half baths; a flex room or study; upper-level lofts, three-car garages; and charming outdoor spaces with optional covered patios. Prices from the low $400,000s. Willow Tree by William Lyon Homes features well-planned single-family homes with interiors spanning from approximately 2,260 to 2,744 square feet. Floorplans showcase three to four bedrooms, including a first-floor bedroom; two and one-half to three baths; a large Great Room and dining space; a spacious master bedroom with walk-in closet; an upstairs bonus room; and two-car garages. Prices start from the low $400,000s. The lifestyle at Audie Murphy Ranch is a phenomenal draw for homebuyers, delivering a resort-style experience that includes a wide array of recreation. The Ranch House and The Plunge are two irresistible amenities, which combined offer an impressive 3,149-square foot recreation center, numerous swimming pools to enjoy year-round, a tot lot, game area, cozy firepit, BBQ and picnic spaces, plus a grassy amphitheater. Spirit Park, the 11-acre Sports Park and 3.4-acre Silver Star Park bring even more opportunities for outdoor fun with lighted tennis courts; multiple basketball courts; soccer and baseball fields, walking trails, a skate park, a playground and other great attractions. Access to a high-quality education is also a crucial factor for many homebuyers and Menifee’s top-notch public schools are an unbeatable advantage of owning at Audie Murphy Ranch. Children in grades K–5 are included in the Menifee Union School District with outstanding institutions that boast high API scores above 800. The commitment to excellence is evident in all aspects of education, from the strong curriculum to respected teachers who inspire students to succeed. Residents attend Taawila Elementary School, which is located on-site at Audie Murphy Ranch, as well as Herk Bouris Elementary School, Menifee Valley Middle School and Paloma Valley High School. Charter school options include the K–12 Santa Rosa Academy in Menifee. new home neighborhoods for classic family living. Bordering an ecological preserve, Salt Creek is in the center of Audie Murphy Ranch, while miles of meandering trails and paseos link residents to community amenities.